Try making some of these Thai recipes for yourself! 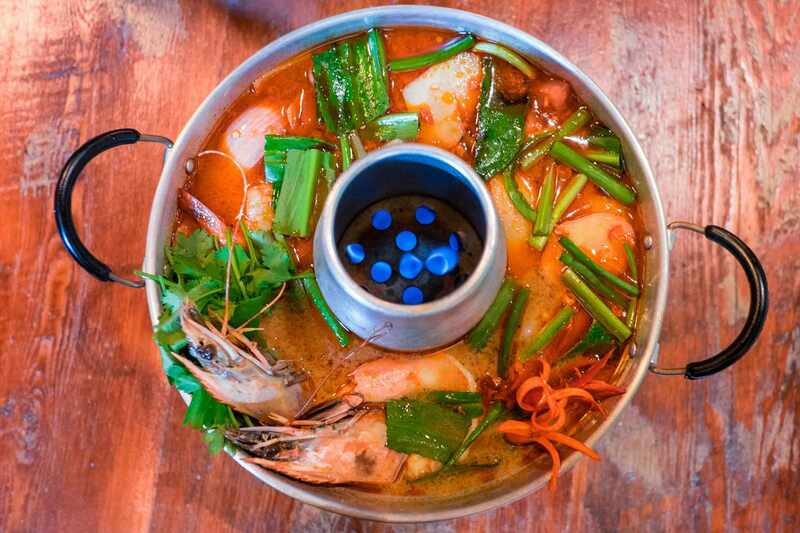 Tom yum kung is a classic Thai soup that is as delicious as it is nutritious. Its spicy-delicious taste will awaken your taste buds and enhance your mood. Well known for its many health benefits, this soup is the perfect medicine for a cold or flu bug (it is touted to boost the immune system). Thai pumpkin coconut soup tastes like those you may have tried at your favorite Thai or Vietnamese restaurant. In Thailand, pumpkin and coconut milk are commonly paired to make a variety of both savory and sweet entrées. In this recipe, the two come together beautifully in a lightly curried and creamy Thai soup. This Thai green curry recipe features tender, thinly-sliced pieces of beef or bison simmered together with eggplant and red pepper. This curry is sumptuous and wonderful on a chilly night. The homemade green curry paste is what makes this dish sing, so don't be tempted to substitute the store-bought variety, especially when it's so easy to make from scratch, and so very flavorful and fresh-tasting. This Thai basil pork stir-fry is classic Thai at its tastiest. Usually, this dish is made with ground pork, but nearly any type of pork or chicken can be used like pork loin cut into thin strips. If you're a fan of real Thai food, this recipe is a definite must-try. For yummy Thai noodles, try this recipe for chicken pad Thai with easy step-by-step instructions. This simple noodle dish is healthy and low-fat, so you don't need to worry if you're counting calories. Included are lots of useful tips that will help you cook up the best Pad Thai noodle recipe you've ever tried. This Thai fried rice noodles recipe is simple to make and very flavorful. It can either be fried up with chicken or with tofu if you are vegetarian/vegan. Either way, it's yummy and naturally gluten-free. This pumpkin & sweet potato curry is beautiful to serve and so delicious. It makes for a flavorful side dish but is also a meal unto itself. Chickpeas can be added as an additional protein source, making this a perfect main course for vegetarians/vegans (it was tested both with and without the chickpeas and is delicious both ways). This Thai green mango salad recipe will surprise you with its tastebud-awakening flavors and the mix of textures. Fresh, crisp and wonderful-tasting, you'll want to make this salad a regular item when planning your weekly meals. As a bonus, it's low in calories and fat. Make it as an appetizer or side dish, or enjoy it as a complete meal by adding cooked shrimp, chicken or deep-fried tofu. Any way you make it, this healthy dish will be sure to win rave reviews from all your culinary fans. This Thai baked ribs recipe creates very tender ribs that are tangy-sticky good. They're easily made in your oven, so there's no messy parboiling involved. While they're baking, stir up the special Thai sauce, which makes these ribs taste simply divine. Great for everyday eating, and also makes a terrific party food. This special Thai appetizer recipe is known as meng khum combines ingredients like coconut, peanuts, dried shrimp, and lime. Traditionally it is served on banana leaves, but spinach or basil leaves work just as well (and unlike banana leaves, they're edible). These Thai crab cakes are great to serve at a party or simply as an everyday treat. A definite winner, these crab cakes are crisp on the outside and melt-in-your-mouth delicious on the inside. There's satay and then there's homemade Thai satay. If you've never had the real stuff, then you're going to be blown away by the succulent taste of this Thai chicken satay recipe (with peanut dipping sauce). Strips of chicken are marinated in a special Thai paste, then skewered and grilled on the barbecue (or broiled indoors in your oven). It is then served with homemade peanut sauce for the ultimate taste sensation. Add coconut rice and a Thai salad on the side, and you've got a well-balanced Thai-style meal that's perfect for a party. This Thai fresh spring rolls recipe is truly a refreshing change from regular spring rolls and they're also much healthier (not deep-fried). Make up a "bouquet" today as an appetizer, snack, or part of the main course (served with a Thai salad, these rolls make a complete meal). This bok choy recipe is terrific to serve as a side vegetable dish or add tofu or your choice of chicken, pork, or seafood for a delicious mixed stir-fry dish. Easy and quick to make, this recipe will fast become one of your vegetable favorites. This Thai ​mussels recipe makes a great appetizer or main course dish. Fresh mussels are simmered in delicious Thai sauce for a seafood dish that is easy to make and tastes divine. Pair with a nice wine for a gourmet-good treat. This Thai green curry recipe is made from scratch -- no need to buy any pre-packaged curry pastes -- which makes this recipe healthier and fresher. At the same time, it's fast and easy to make with a food processor, chopper, or blender. Add chicken and vegetables, and you have a one-pot meal that tastes just as good (if not better) the next day. This Thai pumpkin curry recipe offers the bright colors of autumn -- orange, yellow, and red -- together in a curry infused with citrus accents. You'll love the unique taste of this dish, as well as its healthy combination of vegetables, including pumpkin (or squash), yam/sweet potato, carrots, yellow bell pepper, and cherry tomatoes. Add chickpeas as a protein source, then finish the dish with a sprinkling of pumpkin seeds and nasturtium flowers for a gourmet Thai treat that's as beautiful as it is delicious. If you enjoy seafood, you'll love this sumptuous Thai seafood curry recipe. It starts with a healthy homemade, rather tart curry sauce that goes well with fish. The sauce is heated in a wok or deep frying pan, to which an assortment of nutritious vegetables are added, plus cubes of pineapple and mixed seafood, all of which cook up in no time. It's a healthy, one-pot gourmet delight that will impress your friends and family. Make it as the main course for your next potluck or dinner party. If you're looking for a delicious and beautiful dish to serve guests, try this Thai shrimp curry recipe. The curry sauce recipe is easy to make -- just stir together with a few basic ingredients, or blend them up in a food processor, chopper, or blender. Adding sweet and sour notes are fresh or canned pineapple chunks plus coconut milk and dry toasted coconut for a tropical-tasting Thai curry you'll want to make again and again. This roasted lemongrass chicken recipe is fragrant and moist. It is delicious as is or serves it together with sweet lime sauce for a low-fat and delectable Thai treat your family and friends (including the kids) will love. This is a refreshing change from plain roasted chicken. This Thai barbecued chicken recipe is truly bursting with flavor. Marinated first in a garlicky sweet-and-sour sauce, the chicken is then easily barbecued to perfection. Add a tangy Thai sauce as either a dip or a glaze (recipe included), and this dish will be the life of your dinner or lunch party. Thai pineapple fried rice is heavenly and also healthy. This pineapple fried rice recipe is easy and can be made either with shrimp. Serve as is or in a pineapple boat as the Thais do (​see how to create a pineapple boat). The signature dish of Thailand, this recipe is sure to impress when served at a party or potluck. This Thai stir-fried lemon shrimp features both lemon and lime flavors for the ultimate shrimp dish. And unlike most shrimp recipes, it doesn't contain a lot of cream or butter. Lemongrass adds to the lemony taste, while lime leaf and lime zest contribute an extra bit of zing. Mango sticky sweet rice pudding is a Thai classic. The sticky rice combines well with a sweet coconut sauce and slices of fresh mango. You also can use frozen mango during the winter when mangos are out of season. If you like tropical flavors, give this one a try. This Thai fruit ​salad is beautiful to serve as either a side dish or dessert. Take it to your next potluck or dinner party where everyone will enjoy the flavors of fresh tropical fruit combined with a coconut milk dressing/sauce. If desired, serve it in a carved-out pineapple, as pictured here. This pandan sticky rice layer cake is pretty to serve and it also happens to be healthy because it is lower in sugar and fat than most cakes, and completely gluten- and lactose-free. Serve this dessert on its own or with a sprinkling of fresh fruit. It makes a nice cake to serve during the holidays. This ​easy mango sorbet recipe is great to make for company. Serve plain or with a little coconut liqueur drizzled over for a gourmet adult treat. This is a Thai version of tapioca pudding that is easy to make and better than Western-style tapioca. ​​Tapioca mango pudding can be served warm in the winter or cold in the summer. As a bonus, it's healthy, vegan, and gluten/lactose-free.